Located at a distance of around 18 km from Gangotri, the seat of the Holy River Ganga, Gomukh is the snout of the Gangotri Glacier, from where the river Bhagirathi initiates. This glacier is one of the main sources of the River Ganges. Gomukh is situated at an altitude of 13,200 feet above the sea level. 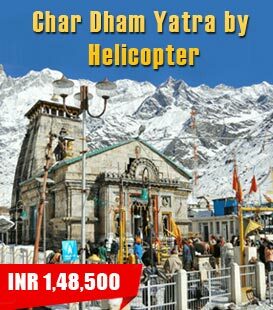 This holy destination even finds its mention in the Hindu’s Holy Scripture, the Puranas. The word ‘Gomukh’ is a combination of two Hindi words- Go + Mukh, meaning ‘Mouth of a Cow’. It is said that originally the snout exactly looked same like a cow of the mouth. Gomukh is a part of some extremely popular trek routes. 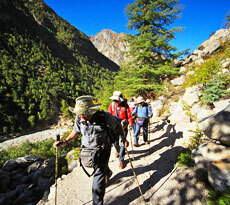 Even to arrive at this place, you need to trek and the trekking route starts from Gangotri. Tourists cross Gila Pahar and Chirbasa. This trek route is full of challenges such as landslides and slopes. The trek then takes you to Tapovan and Nandanvan, two very famous trekking destinations and finally you reach Gomukh. The main attraction in Gomukh is the Gangotri Glacier, known for being the originating point of Ganga river. Surrounded by snow-clad peaks of Thalay, Meru, Shivling, Bhagirathi III and Sagar, this is the biggest glacier of the Himalayan Region. Another attraction is a small temple at the mouth of the cave of the Glacier.